We’re fully-bonded and insured because we respect out workers and we also respect you as a home or business owner. Why take chances with an anonymous seasonal lighting company through a classifieds website? It’s simply not worth risks. That’s why Clear Cut Group not only has insurance but we also take every precaution possible to ensure the safety of our workers. From regularly maintained vehicles to training from experts with years of experience we go above and beyond to ensure that every job is beautifully and safely. Clear Cut Group understands and appreciates that festival lighting can be a very large undertaking whether it be for the exterior of your house or commercial projects to show how much you care about the festival of lights. 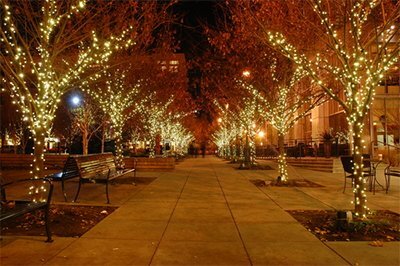 Speaking of which, did you know that seasonal and festival lighting can increase business? Several studies have proven that when consumers see festival and seasonal lights associated with businesses they’re more likely to enter and spend money. We’re fully-bonded and insured because we respect out workers and we also respect you as a home or business owner. Why take chances with an anonymous seasonal lighting company through a classifieds website? It’s simply not worth risks. That’s why Clear Cut Group not only has insurance but we also take every precaution possible to ensure the safety of our workers. From regularly maintained vehicles to training from experts with years of experience we go above and beyond to ensure that every job is beautifully and safely. Clear Cut Group offers both residential and commercial Diwali lighting service to residents of Peel, Halton and surrounding areas. Choose from a variety of Diwali lighting options. Do you wish to set up lights on the outside of your house or business? Some bushes or even some tall trees? Clear Cut Group can do it all. And with thousands of clients over the past decade for installing Diwali, Christmas and Hanukah lighting setups we have a very large number of ideas. We offer a wide range of lights including warm white, pure white and both LED (green energy) and incandescent light technologies. We can even do trees of up to 45 feet tall! Contact our office and speak with one of our specialists. It’s complete free and there is no obligation. Fill out the form on this page. A representative from Clear Cut Group will get back to you and discuss Diwali lighting solutions that suit your budget and needs.